Of all the guests I've had, I'm particularly excited about this one, who last appeared on this podcast in a joint interview with Robert Scoble. 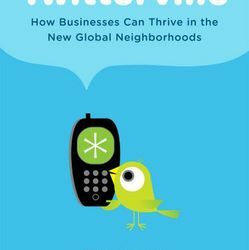 One of the best books I read in 2009 was "Twitterville" by Shel Israel (@shelisrael). I found it so riveting and packed with useful information, that I simply couldn't read it without a highlighter in hand. If you like this podcast, you'll love this book. For a preview, listen to this in-depth, one-on-one discussion with Shel Israel about how organizations can use social media to sustain customer loyalty when things go wrong, human interaction as a replacement for the false image branding often conveys and the future prospects of Twitter as a company and a service. 01:30 -- Shel Israel agrees to let Eric Schwartzman publish his "Twitterville" book notes, the author's feelings about the book and whether the title sells it short. 04:45 -- At big organizations, employees are often encouraged to stay in their lane. From an operational standpoint, how does someone like Frank Eliason of @ComcastCares get the cable repair truck to show up on time, or get modifications made to someone's cable bill? Achieving buy in for social media customer service programs enterprise wide. 09:37 -- A discussion of the Motrin Moms backlash on Twitter prompted by Jessica Gottlieb in response to a commercial she found to be insensitive, and whether or not organizations are sometimes too quick to capitulate and rollover in response to customer protests, regardless of whether or not they believe the protests are reasonable. 13:06 -- The herd or pack mentality often pervasive when and where people congregate online, how it relates to individual and organizational behavior and what Motrin's real failure was in how they dealt with the #motrinmoms incident. 14:47 -- Frank Rose's article in Wired Magazine titled "Commercial Break" about the consumer generated advertising campaign for Chevy Tahoe, which is often hailed among social media pundits as a case study for what not to do, but which actually resulted in increased sales, market share and shorter sales cycles. Note: Frank Rose has been featured in a previous episode of this podcast. 19:17 -- Why and how the way organizations like @WholeFoods and @Starbucks approach to Twitter is more in line with the Land of Oz than with reinforcing and underscoring a commitment to transparency and authenticity. 21:17 -- Reconciling Julian Smith and Chris Brogan's claim in their book "Trust Agents" that organizations should "never leave an empty unused account anywhere because it's as much an indicator of neglect as a dirty desk" against the belief that logo Twitter accounts are, generally speaking, not as effective as individual accounts because who wants to talk to a Coke can? 22:31 -- Branding as a creative, false image that companies manufacturer to try to convince you that their products, brands, and services are something they're not, and how Twitter presents organizations with an opportunity to replace that model with a more authentic, legitimate experience based on human interaction. 25:08 -- Identifying the friction between subjective and objective Tweets, and whether or not some sort of distinction between the two could suggest a practical, reasonable governance policy for organizations that are on the fence about whether to Tweet under branded or individual accounts. 27:45 -- If organization's embrace a Twitter strategy that encourages employees to use their individual accounts, how can those organizations preserve the relationships employees establish on their behalf after they exit the company? 29:07 -- Shel Israel's experience working withThe MCI, which at the time was engaged in an aggressive telemarketing campaign, to explain why the effectiveness of organizational communications cannot be measured by raw data alone, and the notion that social media may, for the first time, present organizations with a more fiscally-responsible channel for expanding marketshare. 32:18 -- Customer service as the new PR and solving problems via social media in full view of everyone. 33:00 -- A discussion of how automaker Toyota has set up and organized their twitter presence under a branded, logo account @Toyota but with the employees tweeting on the companies that have listed in the sidebar are custom background JPEG. 34:29 -- Using Andrew Sinkov who tweets @evernote and Apple Computer as a backdrop, a discussion about the importance of good conversation versus product performance. 35:31 -- While superior product performance and qualified employees may render social media less important, sustaining customer loyalty when things break is going to be much more difficult for opaque, secretive organizations that have no goodwill in the online community. 38:08 -- The future prospects for Twitter as a company, micro-blogging as a communications channel and concerns about twitter as a single point of failure. 42:45 -- Shel Israel's new book, about the software company SAP, which he is co-writing with Mark Yoltan, SVP of the SAP community network. Note: Thanks to Shel, Mark Yolton to has been featured in a previous episode of this podcast on B2B Social Networking. On the Record…Online is the Official PR Podcast of the2010 PRSA International Conference. Subscribe via RSS or follow us on Twitter @ontherecord.